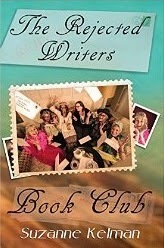 When small-town librarian Janet Johnson is persuaded to attend a gathering of local eccentric lady writers known as “The Rejected Writers Bookclub,” she gets pulled into a kaleidoscope of craziness she never knew existed. Coerced by their formidable team leader, Doris Newberry, she embarks on a crazy cross-country dash with a band of merry writers to save the club. As the intrepid adventurers race to complete their quest, the women's lives are irreversibly changed as they bond together through landslides, haunted houses, false labor, and first love.